Earlier this year, while working on the recipe archive of the blog I realized that I haven't shared too many Indian recipes. Weird. Because I am an Indian. Grew up eating Indian food all my life. Love my spices and enjoy their aroma and flavors in all that I cook. Yet when it came to blogging I shared so little of my food and culture. 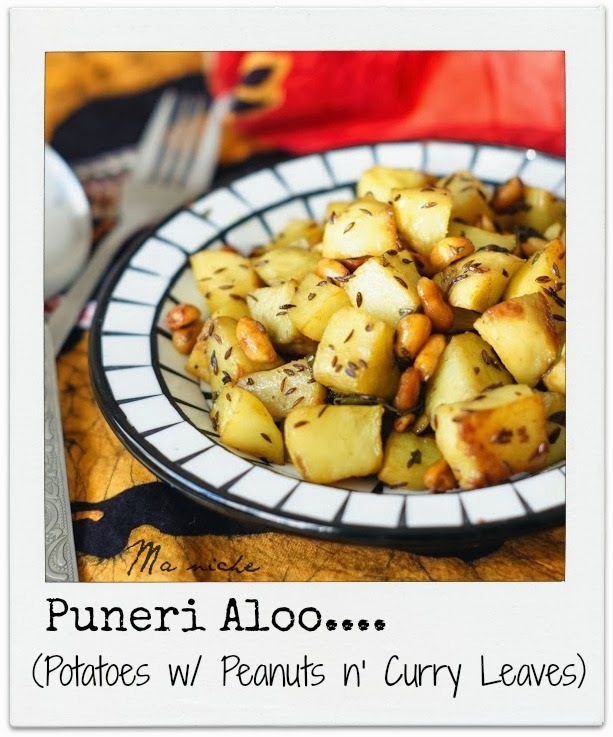 So I decided to share at least one Indian recipe each week..
Keeping with the spirit I chose to share Puneri Aloo with you today. It is a traditional potato preparation flavored with curry leaves and peanuts. 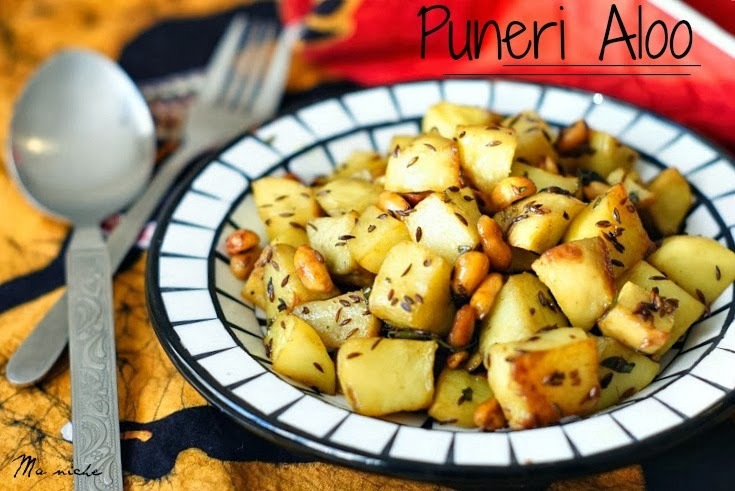 The name suggests that the dish is from the city of Pune in Maharashtra. Must be so. But I haven't had this dish in Pune. I have only tasted the version that came in "The Samsung Book of Indian Microwave Cooking by Tarla Dalal," the book that I often referred to in my early days in kitchen. Soak the diced potatoes in water for at least 30 minutes. When ready to cook, center the rack and preheat oven to 425 ° F.
Drain the soaked potatoes, pat them dry and put them in a medium sized oven proof bowl . Add 1½ tbsps of oil and salt to the bowl and toss well so that the potatoes are coated with the oil. Transfer to the preheated oven and bake uncovered for 20 minutes. In the last 5 minutes, heat the remaining oil in a frying pan. Add the cumin seeds, curry leaves and split green chilies to it and cook until fragrant. Add the cooked spices, roasted peanuts and sugar to the semi-roasted potatoes. Mix well and cover the bowl loosely with an aluminium foil. Return the bowl to the oven and bake for another 15-20 minutes, until the potatoes are well cooked. Garnish with coriander and serve as a side dish with dal and roti . p.s: I used dried curry leaves and very little coriander, so you hardly see the green in my photographs. Using fresh curry leaves and coriander brightens up the dish further. I made this dish long before, you made it very perfectly, delicious. wow such an delicious dish :) love the combo potato with peanuts !! very inviting !! What an exciting dish, I can't wait to try these potatoes, the flavors will be awesome! Thank you so much for sharing with Full Plate Thursday and hope you have a great week! I've never had potatoes with peanuts in a spicy dish like this before - fascinating and sounds very tasty!